As we get older, one of the things that many people fear is losing their independence. No one wants to have to be dependent on others to care for them; we all want to be able to live freely and do as we please. Often, the event that precipitates a person becoming dependent on others to care for them is a serious fall. A person falls and breaks a hip. It never quite heals properly, and after that they are unable to care for themselves in their own home. Sometimes, even if it does heal well, the event can change their lives. The senior citizen or their family members may be too afraid for them to live independently due to the looming threat of another fall. You probably know an older person who has had a serious fall at some point; in fact, falls are the most common source of injuries amongst older adults. The key to retaining independence is retaining your mobility, and the key to retaining your mobility is ensuring good balance. There are several things that you can do to improve your balance. First, you should take good care of your body. Being active and getting plenty of exercise is important. Many people believe that, as they age, they should rest and not overdo it. However, the truth is that staying active is good for your body. It improves your balance as well as your overall health and reduces your risk of falls. Use a three-step process to check each pair of shoes that you try on. First, squeeze both sides of the heel of the shoe. The heel should feel stiff and not collapse when you press on it. Second, bend the tip of the shoe to determine whether the toe box is flexible. The toe box of the shoe should bend just a bit; you don’t want it to be completely stiff and inflexible, but it should still offer some firmness and support. Finally, try to twist the middle of the shoe. A supportive shoe should not be able to twist. Ask a professional. Get both of your feet measured by a professional at a custom shoe shop every time you shop for shoes. It’s not uncommon for feet to change sizes over time. It’s best to shop for shoes late in the day, when the feet tend to be most swollen. Don’t forget your socks. Wear or bring the socks that you intend to wear with your new shoes when you go shoe shopping. Try on the new shoes with these socks to ensure that you get the best fit. Pay attention to how the shoes feel when you try them on. They should feel comfortable and supportive as soon as you try them on. If you feel at all unsteady while trying the shoes on, don’t buy them. There are better options out there that will give you more support and stability. These steps will help you to find shoes that improve your balance and mobility. 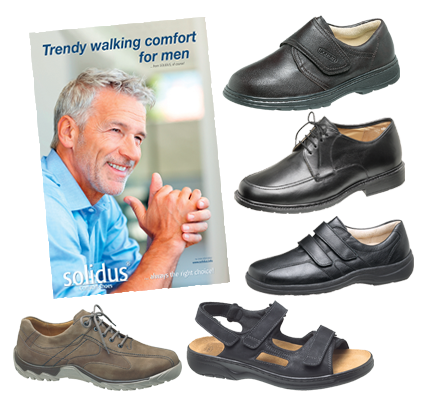 When you are looking for new shoes for improved balance, visit Foot Solutions. Foot Solutions offers a wide variety of supportive footwear for all types of foot problems, as well as over the counter or custom arch supports for additional stability.